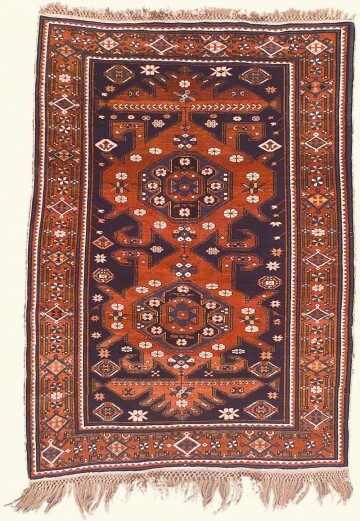 This late 19th Century Kuba was handwoven in a tribal village in the Republic of Azerbaijan. High in the Caucasus Mountains, the sheep produce wool with an especially lustrous quality. Finely knotted wool on wool warp construction with design features including stylized rosettes and stars. Navy and brick colors dominate a field with ivory, yellow, green accents. Consider this distinctive Kuba a long-time collector’s piece that has been well cared for.